By fostering a culture of wellness and inclusion, we’ve created a supportive, diverse community of peers. We are proud to be an Equal Opportunity Employer and a recipient of the Times Union “Top Workplace” award. 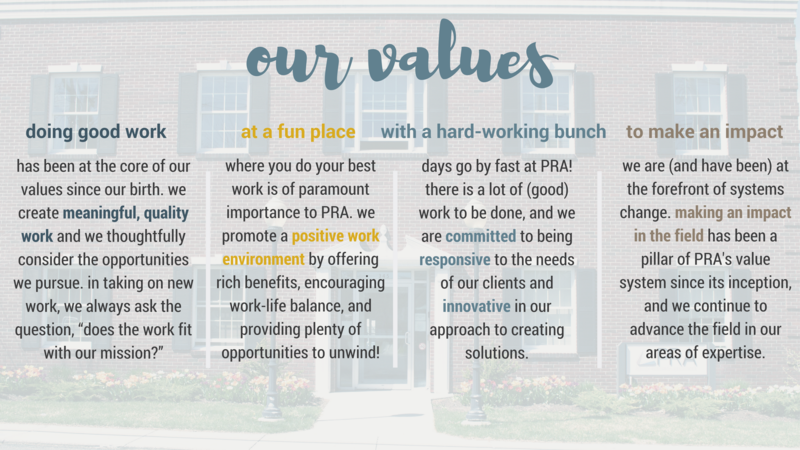 View our Year in Review to learn more about what it is like to work at PRA. Policy Research Associates, Inc. (PRA) is seeking a full-time Research Associate to join our youth justice team. The Research Associate will provide support on various studies currently being conducted at the National Center for Youth Opportunity and Justice (NCYOJ), which is housed at PRA. The NCYOJ was founded in 2001 to advance policy and practice to ensure the well-being of vulnerable young people in contact with the juvenile justice system. A leader in the behavioral health and human services field for over 30 years, PRA is a small business funded by federal and state agencies, national organizations, and foundations. PRA conducts research and evaluation; provides technical assistance and training; and plans and facilitates major conferences, meetings, and other knowledge-transfer activities in the behavioral health field. PRA is known for its expertise on behavioral health issues related to juvenile and criminal justice; services for children, adolescents, and their families; recovery supports; service members and veterans; homelessness and housing; and violence. Policy Research Associates, Inc. (PRA), a leader in the behavioral health and human services field for 30 years, is a small woman-owned business located in Delmar, NY. Funded by federal and state agencies, national organizations, and foundations, PRA conducts research and evaluation; provides technical assistance and training; and plans and facilitates major conferences, meetings, and other knowledge-transfer activities in the behavioral health field. The National Center for Youth Opportunity and Justice (NCYOJ) is operated by PRA. At the core of NCYOJ’s work is the belief that translating research into policy and practice is vital for effectuating change. This translational work creates more effective and efficient systems, which produces better outcomes for youth and families while maintaining safety for youth and families, youth-serving professionals and communities. PRA is seeking to fill an internship position with NCYOJ for the summer of 2019. Duties will include conducting in-depth literature reviews on topics related to adolescent mental health, creating infographics and fact sheets, assisting with the compilation of relevant materials for an online resource repository, developing meeting minutes, assisting with coordination and logistics for project meetings and travel, and other tasks as assigned. High-level supervision/mentorship will be provided. Policy Research Associates, Inc. (PRA), a leader in the behavioral health and human services field for 30 years, is a small woman-owned business located in Delmar, NY. Funded by federal and state agencies, national organizations, and foundations, PRA conducts research and evaluation; provides technical assistance and training; and plans and facilitates major conferences, meetings, and other knowledge-transfer activities in the behavioral health field. Policy Research Associates, Inc. (PRA), a leader in the behavioral health and human services field for 30 years, is a Women-Owned Small Business located in Delmar, NY. Funded by federal and state agencies, national organizations, and foundations, PRA conducts research and evaluation; provides technical assistance and training; and plans and facilitates major conferences, meetings, and other knowledge-transfer activities in the behavioral health field. PRA is seeking to fill a Logistics Internship position for the spring semester of 2019. Duties will include coordination and confirmations for registrations, travel arrangements, room block registration lists, and other logistics tasks for meetings and conferences. The intern will be assisting the Logistics Coordinator along with Project Assistants in all aspects of meeting planning. High-level supervision/mentorship will be provided. Knowledge of basic meeting logistics with an understanding of timelines and requirements for meeting management. Computer proficiency in accounting software and Microsoft applications with a strong working knowledge of Excel preferred. Strong organizational skills, attention to detail, and ability to work within timelines. Policy Research Associates, Inc. (PRA) is seeking a full-time Project Assistant to support a national SAMHSA-funded project (SOAR) designed to increase access to the disability income benefit programs administered by the Social Security Administration (SSA) for eligible individuals who are experiencing or at risk of homelessness and have a serious mental illness, medical impairment, and/or a co-occurring substance use disorder. (https://soarworks.prainc.com) This position will be based on-site in PRA’s Delmar, NY office. A leader in the behavioral health and human services field for nearly 30 years, PRA is a small business funded by federal and state agencies, national organizations, and foundations. PRA conducts research and evaluation; provides technical assistance and training; and plans and facilitates major conferences, meetings, and other knowledge-transfer activities in the behavioral health field. PRA is known for its expertise on behavioral health issues related to juvenile and criminal justice; services for children, adolescents, and their families; recovery supports; service members and veterans; homelessness and housing; and violence. Minimum: Bachelor’s degree in a related field. Excellent communication and interpersonal skills and strong attention to detail. Ability to work in a fast-paced environment. Proficiency with Microsoft Office Suite (Outlook, Word, Excel, PowerPoint). Preferred: Background in homelessness or disability field preferred. Some experience in a team-based work environment, managing the use of virtual meeting technology, website management, database management, and/or logistics coordination. The position is full-time, immediate opening with a competitive salary and excellent benefits package. Located on-site at PRA’s offices in Delmar, NY. Some travel may be required. PRA is an Equal Opportunity/Affirmative Action Employer and was selected the Times Union #1 “Top Workplace” for 2018. Policy Research Associates, Inc. (PRA) is seeking a full-time Senior Project Associate to support a national MacArthur Foundation-funded project designed to provide intensive technical assistance to the MacArthur Safety and Justice Challenge Network surrounding issues of reducing the over-incarceration of individuals with serious mental illness (SMI) across the Network jurisdictions. The Safety and Justice Challenge is an initiative to reduce over-incarceration by changing the way America thinks about and uses jails. The initiative—an initial five-year, $150 million investment by the John D. and Catherine T. MacArthur Foundation—currently supports a network of 52 jurisdictions across 32 states. The John D. and Catherine T. MacArthur Foundation’s Safety and Justice Challenge recognizes that there are better, fairer, and more effective alternatives to excessive jail incarceration. The Safety and Justice Challenge is supporting a network of competitively selected local jurisdictions committed to finding ways to safely reduce jail incarceration. A leader in the behavioral health and human services field for over 30 years, PRA is a small, woman-owned business funded by federal and state agencies, national organizations, and foundations. PRA conducts research and evaluation; provides technical assistance and training; and plans and facilitates major conferences, meetings, and other knowledge-transfer activities in the behavioral health field. PRA is known for its expertise on behavioral health issues related to juvenile and criminal justice; services for children, adolescents, and their families; recovery supports; service members and veterans; homelessness and housing; and violence. Policy Research Associates, Inc. (PRA), a leader in the behavioral health and human services field for over 25 years, is a small business located in Delmar, NY. Funded by federal and state agencies, national organizations, and foundations, PRA conducts research and evaluation; provides technical assistance and training; and plans and facilitates major conferences, meetings, and other knowledge-transfer activities in the behavioral health field. PRA is known for its expertise on behavioral health issues related to juvenile and criminal justice; co-occurring substance use disorders; services for children, adolescents, and their families; recovery supports; service members and veterans; homelessness and housing; and violence. PRA is always interested in hearing from qualified candidates interested in pursuing an internship. The internships typically involve various project tasks in several topical areas, including criminal justice, juvenile justice, recovery supports, and operations. High-level supervision/mentorship is provided for these internships. PRA is an Equal Opportunity Employer and was selected the Times Union #1 “Top Workplace” for 2018.